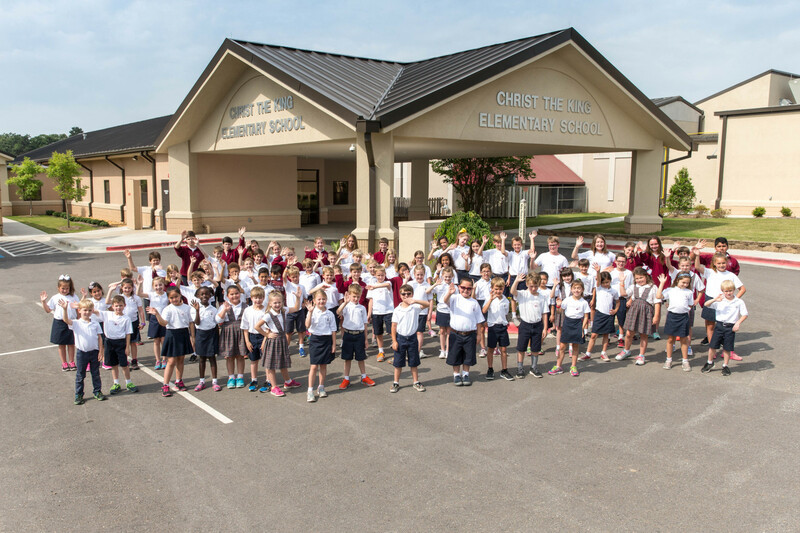 The main purpose of good discipline at Christ the King School is to train the pupils in self-discipline. Self-control on the part of students is essential to good classroom order. To bring this about, the school has imposed regulations, which every student is expected to follow. Students are to be courteous at all times, in all places. A learning atmosphere and discipline are practically synonymous. It is our desire to instill respect for authority and for the rights of others. Students must fully understand that ANY teacher has the authority to correct misconduct at any time. Christ the King School does not condone any form of harassment. All individuals are to be treated with dignity and respect. Harassment in any form is prohibited. The prohibition against acts of harassment applies to all individuals involved in the school. Christ the King will not tolerate bullying in any form and has universal jurisdiction concerning bullying to include e-mail, blogs, etc. The administrator reserves the right to waive and/or deviate from any and all disciplinary regulations for just cause at his or her discretion. Since a Christ the King student represents the school at all times, both on and off campus, it should be understood that any conduct which brings discredit to the student or to the reputation of Christ the King School and its community may result in disciplinary action by the school. Five points will be deducted from the student’s conduct grade for each of the above infractions. Any student who incurs 4 conduct infractions in one day will be sent home for the remainder of the day and will be assigned to Detention Hall on the following Thursday. Assertive discipline is an important part of Christ the King. However, realistically, with some students other measures will have to be taken from time to time. Detention Hall will be held for Grades 4 - 8 on Thursdays, after school from 3:00 until 4:30 p.m. This may be a silent, sit still time, a study period, or a work detail as determined by the teacher on duty. If the student fails to be on time, an additional detention hall will be set automatically. Detention Hall will be served on the Thursday following the day the student receives the Detention Hall form from the teacher. The teacher will send the student to see the principal; parents will be called through the office and informed of the Detention Hall assignment. If for some legitimate reason such as prior appointment (doctor, orthodontist, etc.) a student cannot report for detention hall, a parental note will be required by Thursday morning to that effect. An alternate date will be assigned by the principal. Failure to serve the detention on the assigned date will result in a detention for the following Thursday plus an additional Thursday. 1st & 2nd Detention Hall Thursday, 3:00 to 4:30 p.m.
* Work graded while the student is suspended will receive an automatic zero and conduct grade will be a zero for each day the student is suspended. The above procedure is general and the principal may alter the procedure if the offense warrants immediate suspension or expulsion. THE POSSESSION, USE, DISTRIBUTION OF ILLEGAL DRUGS OR ALCOHOLIC BEVERAGES IS NOT PERMITTED IN THE SCHOOL, ON THE SCHOOL GROUNDS, OR AT ANY SCHOOL FUNCTION. If any student brings to school or has in his/her possession any drug or alcohol during school hours or at any school function, regardless of time or place, he/she is liable for expulsion. He/she will be suspended immediately and parents will be notified. Return to school will be contingent upon the student being actively involved in professional counseling and/or therapy if chemical dependency is evident. A second offense will result in automatic expulsion. When a student is involved in the distribution of alcohol/drugs to other students, whether for financial gain or not, he/she will automatically be expelled from school. The distribution of drugs in the State of Arkansas is a felony. Secondly, the action is aiding and abetting another youth in an illegal action. Such conduct will not be tolerated by the Diocese of Little Rock and it’s school system. A student with four major infractions in one school year is subject to possible probation for the next school year. A student with five major infractions in one school year may be denied admittance for the next school year. Disruptive or inappropriate behavior by a student at school sponsored activities that occur outside of normal school hours (athletic events, programs, etc.) will be subject to the same disciplinary actions as if the offense took place during normal school hours. Dances are not permitted as school-sponsored functions for elementary schools. Parents and or guardians should be encouraged to sponsor other entertainments and activities for elementary students (diocesan policy 4.39). ANY PERSON FEELING AGGRIEVED CONCERNING ANY MATTER CONNECTED WITH THE SCHOOL WILL CONTACT THE INDIVIDUAL CONCERNED BEFORE DISCUSSING IT WITH OTHER PATRONS. School Board members are not to attempt to solve problems but are to refer the aggrieved person to the above procedure. If a board member is approached, he/she will notify the principal. Respect and courtesy should be shown at all times to all adults and fellow students. We expect children to conduct themselves in a refined, courteous and Christ-like manner at all times - at play and at work. The following are responsibilities of parents whose children attend Catholic schools. As a parent of a Catholic School you have a responsibility to partner with the school and to promote your school and speak well of others. Ultimately, you are solely responsible for what you post online. Before creating online content, consider some of the risks and rewards that are involved. Keep in mind that any conduct that adversely affects employees, students or families of the parish or school may result in disciplinary action up to and including withdrawal of your child from the school and/or legal action. All items which a student brings to school or the after-school program shall be marked with his name (sweater, sweatshirt, coat, gloves, cap, etc.). This includes both of a pair. If a child misplaces or loses articles at school, he should check the CLASSROOM OR LOST AND FOUND SHELF. Electronic devices need to be pre-approved before being brought to school. Sports equipment should also be left at home. Such belongings can be lost or broken at school. We would appreciate your help in keeping toys and equipment at home. LASER POINTERS & KNIVES of any kind are forbidden and are not to be brought to school. NO OTHER WEAPONS, REAL OR TOY, shall be brought to school at any time. *Cell phones and smart watches that are brought to school must be checked in with homeroom teachers before school and checked out at the end of school. No personal toys or games are to be brought to school without permission in advance from the teacher or after school program. NO GUM IS EVER ALLOWED ON THE SCHOOL PREMISES! A student shall never bring to school any more money than is needed for fees. Children are often careless and forget where they leave things, and money is the most difficult to identify. Please caution your children about leaving money where it will be a temptation to others. The school is not responsible for items lost, stolen, or broken at school. Since cubbies and desks are the properties of the school, periodic checks of both cubbies and desks, together with their contents may be made by authorized personnel. Such action may also be taken when the principal has reason to believe that they contain certain illegal substances or other items that would be harmful to others in the school community. Personal property such as purses and backpacks may be searched. The school or principal retains the right to amend the policy manual for just cause. Parents will be given prompt notification if changes are made.